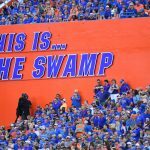 There were not too many changes when the Florida Gators released their depth chart ahead of their Week 2 game against the Kentucky Wildcats other than some “OR” designations being dropped across the board. Redshirt junior Nick Buchanan is now solidly in as the starting center, and the same can be said about freshman Evan McPherson (kicker). Junior Tyrie Cleveland also stepped in as second-string kick returner, passing redshirt senior Dre Massey for the job. 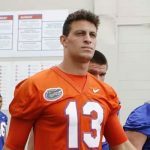 With there being so few changes, speculation remains that some of the Gators suspended for Week 1 may remain out against the Wildcats, but that certainly remains to be seen, and it is unlikely we will know until shortly before Saturday’s kickoff. In terms of injuries, head coach Dan Mullen said Monday that junior linebacker David Reese remains questionable, while redshirt sophomore defensive back C.J. McWilliams is probable to return to the field. Sophomore DB Shawn Davis will miss the Kentucky game, and freshman wide receiver Jacob Copeland will be sidelined 1-2 more weeks. Let’s take a look at the rest of the Week 1 depth chart as announced by Florida entering the Charleston Southern game on Saturday, Sept. 1.